Who is Priscilla Shirer? Priscilla is married to Jerry Shirer, and is a mom to three sons. She is a gifted writer and international speaker. She has written a number of Christian books and Bible Studies. She is also one of the daughters of Pastor Tony Evans. 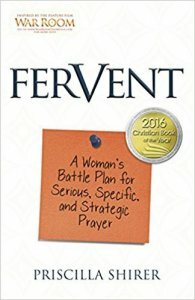 Some of her books include: The Resolution for Women (NY Times Bestseller), God is Able, One in a Million, Life Interrupted, Discerning the Voice of God, Awaken, The Armor of God, and more. She had a starring role in War Room and a role in the recently released I Can Only Imagine. That is the description at the end of the promo on the back of the book. It is just that and is exactly what Priscilla planned for it to be. If you saw the War Room movie, you got a glimpse there of what Priscilla believes prayer should be like. She didn’t write the book, but she did collaborate with the Kendrick Brothers on the movie, and ultimately they decided she needed to play the role of Elizabeth Jordan, the wife in the movie, and she accepted.